The voice and tone of Arroyo sounds a bit like that quirky next door neighbor you had as a kid; you know, the one that wore multicolored bowties and delivered punch lines that were over your head, but somehow you still knew were pretty damn funny. Arroyo loves strong characterization, which makes the magazine itself a character all in its own right. It’s not afraid to take a few risks here and there, and, as Morgan pointed out in our Q&A, is often attracted to the sadder, darker side of human nature. So pour another cup of coffee, put on your headphones to drown out your boss’s superficial pep talk and get ready to meet the magazine that will quickly become your new best friend. While your magazine has plenty of geographically diverse authors, there is an emphasis on work emerging from the Bay Area. What would you say is the dominant style or genre coming out of this location right now? One of my favorite aspects of the Bay Area is its diversity. While attending the region’s poetry and fiction readings, I’m always struck by the range of styles, be it traditional (such as "Broken" by Ellen Bass), experimental (Dean Rader's "The Mapmaker’s Poems: Fragments"), or a mix. Regardless, freshness and urgency of voice seems crucial right now, especially given our region’s diverse population. We have somber, mourning tones (“Rehearsals for Departure” by John W. Evans) beside hilarity (Tim Kahl's "Waiting for Taco"). What are the top three biggest challenges you face as an editor? Coordinating the team regarding content is a primary stress, since I want to make sure everyone’s on-target with their stuff (be it art, poetry, prose, or the interview), while also keeping the staff aware of each other. From there, marketing and promotion is a virtually endless task, whether via bookstores or social media, especially as a younger publication. Lastly, there are always random curveballs, whether it be unforeseen printing crises, contract hassles, or registration woes. What is the magazine’s mission? Arroyo began with an investigation: faculty and students sought to establish a magazine capturing the spirit and diverse voices of the Bay Area while attracting writers from across the country to form a national readership. What they discovered, however, was a void. Bigger presses seemed to ignore the dynamics of California culture, while smaller presses had predicated themselves on niches. With the opportunity presenting itself, those same students built the school’s first literary magazine from the ground up, eventually releasing the premiere issue in Spring of 2009. Since then, our editorial staff has remained dedicated to showcasing both new and established writers from the West Coast and beyond, hoping to connect the magazine’s audience with the unique qualities that make the Bay Area literary and art scene so special. If two famous authors gave birth to a child and that child was Arroyo Literary Review, who would those two authors be? Why should writers submit to your magazine? Why should they want their work to find a home in your publication? Other than finding a home in our beautiful print journal and being promoted online, our writers are presented alongside their peers and established greats. 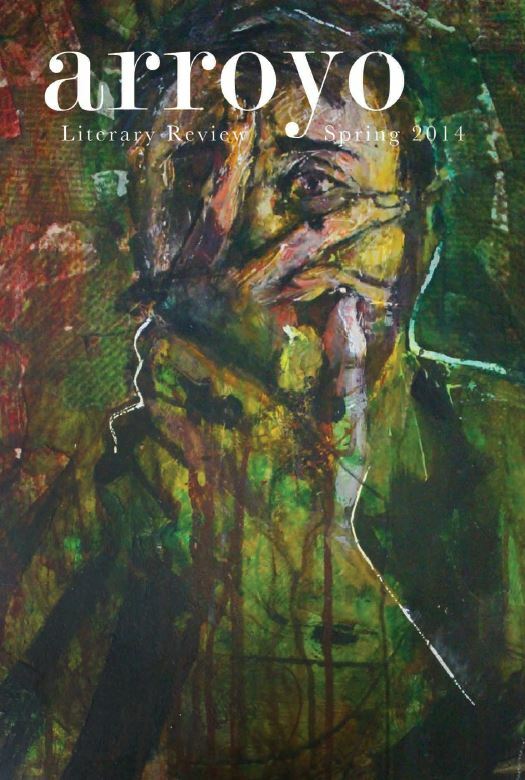 Each issue reflects the creative diversity found in the San Francisco Bay Area literary scene, while bringing together material from an international array of poets, writers, and artists. We're always open to new opportunities, such as the beautiful collaboration in our last issue called “The Tomb in the Woods,” where Tony Barnstone's sonnet sequence was presented side-by-side with Amin Mansouri's gripping illustrations. What do you think the cover of the Issue Six reveals about its contents? I’d like to think that Issue Six’s cover shows our dedication to emotional sincerity. Whether biking across a mountain, or exploring a surreal tomb in the woods, the characters in this issue find themselves in deep interior struggles as they work through their varied circumstances. Christopher Morgan is the Editor for Arroyo Literary Review, growing up in Michigan, Georgia, and California. His writing has been published in Gargoyle, Permafrost, A cappella Zoo, Bartleby Snopes, theNewerYork, Voicemail Poems, and DOGZPLOT, among others. Sometimes he sits at his keyboard, banging on it like a child on a piano; other times, he’s in bed, not sleeping. Sara Palmer, M.A., has a bachelor's in journalism and recently earned her master's in English with a concentration in creative writing. She is excited to no longer be a starving graduate student. Instead, she is now proudly working as a starving writer. Her work has appeared in Gravel, Hobo Pancakes, Allusions and Nick Belardes. In order to feed herself and her two cats, she teaches freshmen English, freelances in digital communications and teaches yoga. In her spare time she is desperately trying to finish a jigsaw puzzle of a Jackson Pollock painting.